f.8 'Cawnpore', 1790. River scene. bl.uk > Online Gallery Home	> Online exhibitions	> Asia, Pacific and Africa Collections	> f.8 'Cawnpore', 1790. River scene. 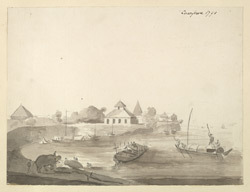 Pen-and-ink and wash drawing of Kanpur by James Tillyer Blunt (1765-1834) in 1790. This is one of 31 drawings (29 folios) of landscapes in Delhi, Uttar Pradesh, Bihar, Orissa, Madras and Mysore made between 1788 and 1800. Situated on the Ganga in Uttar Pradesh, Kanpur was most of the most important garrison towns on the river under the British occupation of India. It is famous for the tragic events which occurred here during the Indian Uprising of 1857. A group of rebels attacked the 400 strong British community and subjected them to an 18 day siege. An apparent truce was offered by the leader of the insurgents, Nana Sahib and the remaining hostages were allowed to escape via a boat downriver only to be attacked and killed at the Satichaura Ghat before they could do so. There were ferocious reprisals as the British exacted their revenge for this atrocity.